The right props are essential for your Christmas costume if you want to make a strong impression. Your outfit will really be remembered if you go the whole nine yards, and that usually requires adding a few finishing touches to give it an authentic feeling. Shop for any of these props to help make your costume a success. 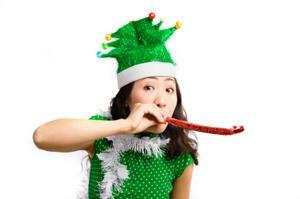 Complete your costume of this jolly old elf with the right accessories. Rectangular Santa Glasses from HalloweenCostumes.com have a thin, rectangular-shaped metal frame and clear plastic lenses. They retail for about $5. Rimless Santa Glasses at Amazon have round, clear plastic lenses with gold-toned arms and bridge, but no frame around the lenses. They retail for about $8. 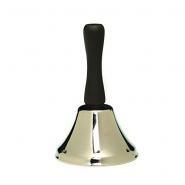 The Santa Hand Bell at Party City, is a brass bell measuring five inches long. It retails for about $6. The 3-inch Santa Bell at Amazon, which is a silver-colored bell with a black handle. It retails for about $7. Santa's Toy Bag at Halloween Express, which is a red bag featuring a picture of Old Saint Nick and the words Season's Greetings. It retails for about $15. Velvet Santa's Gift Sack at Amazon, which is a 36-inch high red velvet bag with a drawstring neck. It retails for about $30. Santa Belly from SantaSuits.com, which is a lightweight belly that slips over the head and ties in the back. It retails for about $22. 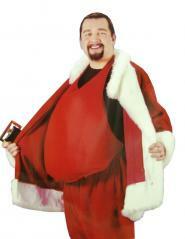 California Costumes Stuffed Santa Belly at Amazon, which is a realistic, one-size-fits all padding that slips over the head. It retails for about $5. The Deluxe Santa's Eyebrows found at Amazon are made of Teviron on a net foundation and retail for about $6. The Authentic Natural Eyebrows found at SantaSuits.com are white, synthetic eyebrows that curl up at the ends. They retail for about $14. Whether you're Dancer, Prancer, the infamous Rudolph, or any of the other reindeers, the right accessories can really make your costume stand out. Plush Reindeer Antlers from Amazon are attached to a headband for easy wearing. They have small ears located just before the antlers and have an inner wire that holds them upright. They retail for about $6. 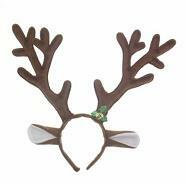 Reindeer Antlers from Costume Craze are a large set of antlers attached to a headband. They have eight prongs and are covered in brown fur. They retail for about $17. The Blinking Light Up Reindeer Nose at Amazon, which fits onto the nose and is held in place with an elastic that goes around the head. It flashes while being worn and retails for about $3.50. An elf costume can be a lot of fun to wear because you decide if your particular elf is mischievous or not. Add to the costume with some great accessories. Elf Ears at Adrani Costumes come in a wide variety of shapes and sizes. All are rubber, and are meant to be worn over your own ears. They retail for $5. 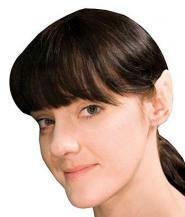 Elven Ear Tips at CostumeSuperCenter.com, which attach to the upper portion of your ear to extend your ear into a point. They retail for between $10 and $20. These costumes are often worn in Christmas plays or church presentations, but can also be fun to wear as costumes. The Shepherd's Crook at Oriental Trading is a brown staff with a curved hook at the top. It retails for about $5. The Brown Shepherd's Crook at CostumeCraze, which is a brown plastic staff with a curved hook at the top. It measures 66-inches in length and retails for about $12. The Angel Wings and Halo found at HalloweenCostumes.com, which includes a marabou halo and synthetic wings. The halo is attached to a headband so it sits above the head. The set retails for about $13. The White Wings and Halo Set found at CostumeSuperCenter.com, which includes a pair of feathered wings and a halo trimmed in marabou that sits above the head. The set retails for about $16. Whether it's a party or a play, make sure your Christmas costume has the right accessories. Get any of these props to complete your costume and make your season merry.